Punjab National Bank rose 1.62% to Rs. 1110.25 at 14:52 IST on BSE, off the session's low of Rs. 1065 after net profit rose 5.80% to Rs. 1200.90 crore on 32.89% increase in total income to Rs. 8585.65 crore in Q4 March 2011 over Q4 March 2010. The bank declared its results during trading hours today, 4 May 2011. Meanwhile, the BSE Sensex was down 67.02 points, or 0.36%, to 18,467.67. On BSE, 1.84 lakh shares were traded in the counter as against average daily volume of 31,679 shares over the past two weeks. The stock hit a low of Rs. 1127.25 and a low of Rs. 1065 so far during the day. 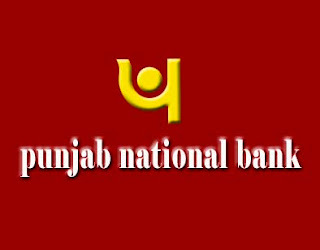 Punjab National Bank (PNB)'s net profit rose 13.52% to Rs. 4433.50 crore on 22.99% increase in total income to Rs. 30599.06 crore in the year ended March 2011 over the year ended March 2010. PNB's consolidated net profit rose 15.16% to Rs. 4574.73 crore on 22.69% increase in net sales to Rs. 31206.60 crore in the year ended March 2011 over the year ended March 2010. PNB's ratio of net non-performing assets (NPA) as on 31 March 2011 was 0.85%, higher than 0.53% as on 31 March 2010. The board of directors of the bank has recommended an annual dividend of Rs. 22 per share for the year ended March 2011. Meanwhile, PNB said it will raise its base rate to 10% from 9.50% and benchmark prime lending rate (BPLR) to 13.50% from 13% from 5 May 2011. 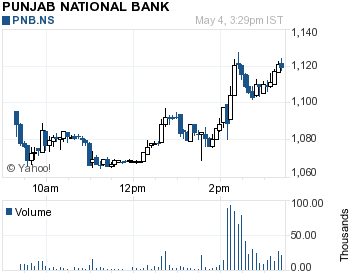 NOTE: For short term gain one can buy the future of PNB for MAY2011 @ 1110 Rs. Target of 1137 Rs.